Immersion heaters are used to quickly and reliably heat liquids that they are immersed in either from the top of an open vessel, or through the side of the vessel into the liquid with a liquid and pressure tight fitting. Immersion heaters are available in many physical configurations, materials and temperature ranges to cover a wide range of applications in industry, science, utilities, domestic and appliances. While most immersion heaters are relatively inexpensive to purchase, they are not particularly energy efficient since they employ a direct electric heating. Immersion heaters are made by encasing a nichrome resistance heating wire in a ceramic jacket which is then surrounded by an Inconel sheath. Inconel is a highly corrosion- and heat-resistant form of stainless steel used for the electric heating elements on electric stoves. As electricity flows through the nichrome wire, it gets hot to the point of glowing and spews heat at a high rate through the ceramic and through the Inconel, until its temperature is high. If it were not immersed, it would glow red just like stove heating elements. Once the Inconel sheath starts to heat, the water surrounding it starts to heat quickly. 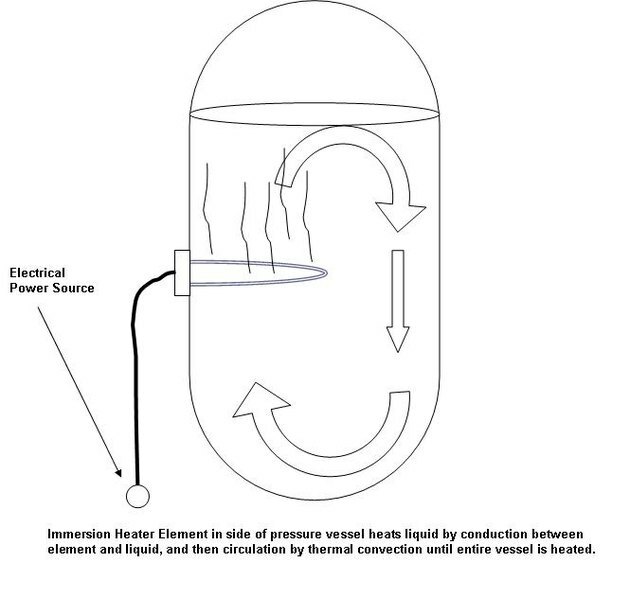 A convection current will be established as water from beneath the element passes through it and rises above the element to the top of the vessel. When the warmer layer reaches the top, it curves around and heads down along the opposite side of the vessel, and then crosses the vessel again to rise beneath the element once again. Convection currents gradually spread the heat relatively evenly throughout the vessel. Since classic hot water tanks store large amounts of hot water over periods of time, much of the heat is lost through the insulation. Instant hot water immersion heaters switch on when water flow starts to a shower stall, for example. Instant units have just a small pressure chamber surrounding the immersion element and water flow is regulated so that just the right amount of temperature is added to exit a reasonably warm shower spray. Portable immersion heaters are used to drop into barrels of water or chemicals to bring to a desired temperature. Other larger systems directly install through tank walls or as wound spirals inside tanks. Immersion heaters are available with self-contained adjustable temperature switches to continuously maintain the liquid at a desired pre-set temperature.